Its winter and its cold, and thus, I’m usually on the hunt for warm, hearty, make you feel good recipes that will also hold well as leftovers that I can take to work for lunch. One day while I was in the meat department at the grocery store, I saw a stack of recipe cards sitting on top of the meat counter. A couple of them caught my eye, and one in particular got me thinking about how much I love chili and pasta, but how I’d never thought to combine the two together. While this recipe is Hamburger Helper-esque, its much healthier and has far less sodium than those box dinners do. 1. Boil water and cook pasta according to directions. Drain and save. 2. While pasta is cooking, cook meat and onion in a large skillet until meat is brown and onions are tender. Drain off fat. 3. Stir in beans, undrained tomatoes, tomato sauce, chile peppers, chili powder, garlic powder, sea salt, and pepper. 4. Cook until thoroughly heated, about 10 minutes. 5. Once chili mixture has heated throughout, slowly stir in pasta. Continue to stir until chili and pasta is thoroughly mixed. 6. With the heat on low, sprinkle with cheese. Let stand for about 2 minutes or until cheese melts. QOTD: What is your favorite “make you feel warm and feel good” meal? This entry was posted in Food and tagged chili, cooking, healthy eating, pasta, recipe. Bookmark the permalink. This looks awesome. We don’t eat a lot of pasta, so I would probably sub quinoa, but definitely a great recipe! And so easy to substitute other ingredients in for something you don’t want to include. This looks really good-I would have never thought to make it in a skillet! Me neither! Its hard to believe that I was inspired to make this from a card I saw at the grocery store. Looks great, but I would have to skip the beans. I wish I liked them, but they just make me gag. Luckily you’ll still have lots of protein with the ground beef. I have a great turkey chili recipe, and it’s so easy to make. When we’re getting a cold snap, I load up on the ingredients and get corn bread. Or better yet, make homemade corn bread or corn muffins! Chili is definitely the perfect comfort food. i’m with pam, i’m just not a huge fan of beans so i’d sub them out w/something else. but this looks great! Tomato soup and grilled cheese, for sure! Or pizza, I always want pizza! lol! Pizza is a great comfort food, for sure. Yum yum yum! 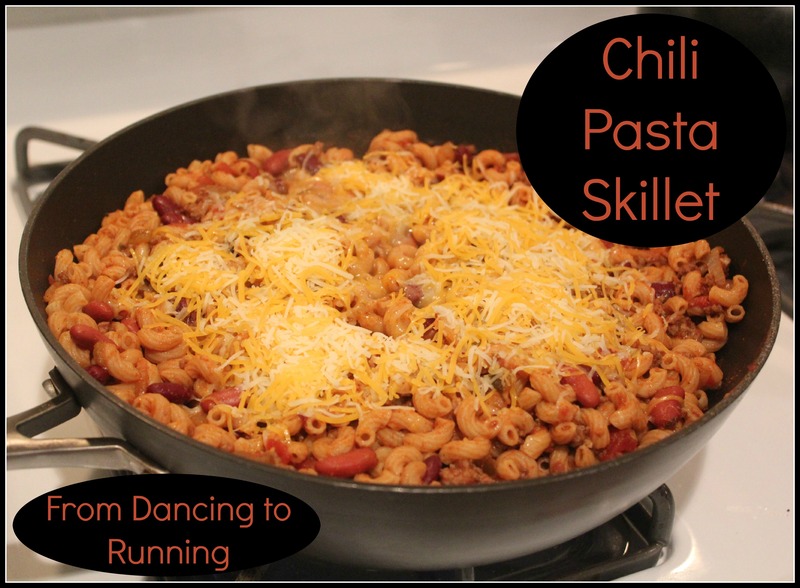 I love chili in the winter (but not the heartburn I get from it…pregnancy problems!). Only a couple more months though and then you hopefully won’t have to worry about the heartburn. I’ve made something similar but with only one can of kidney beans and no chilies. I’ve actually stopped using chili powder because if bothers my GERD. That looks like a great meal to eat on before a long run or something. Really cool. I just made some chili but I didn’t put elbow macaroni in it. That may be something my children love to eat. I could see this easily being something kids would like. I don’t eat meat, but I do eat pasta, so just doing this with the beans sounds yummy. And you’ll still get lots of protein from the beans. I love skillet meals. I haven’t tried one like this before, it looks fabulous! I love these types of meals when I go camping too, I swear the elevation just enhances the flavor:) Thanks for the meal idea! Looks delicious!! Nice to put in the freezer too. This looks like a really cozy meal for the FREEZING weather we’ve had lately! And I appreciate that it is vegetarian! Thank you for sharing! I’m gonna try to make this tonight! I came back to your recipe to see if you use tomato sauce or tomato paste! I love skillet meals and the idea of chilli pasta sounds great, Kathryn. Must prepare this soon!